Earthquake Geology studies the dynamic and impacts of earthquakes on the geological environment, and includes aspects of active tectonic, structural geology, paleoseismology, geophysical analysis and tectonic geomorphology. Field mapping, trenching, remote sensing and GIS analysis, electric resistivity tomography and interpretation of seismic reflection data are some of the techniques we use to highlight every possible subtle evidence left by past earthquakes. We are also familiar with advanced structural geology software and sand-box analogue models. The outcomes of such integrated approach are of particular importance for seismic hazard assessment and mitigation measure planning. 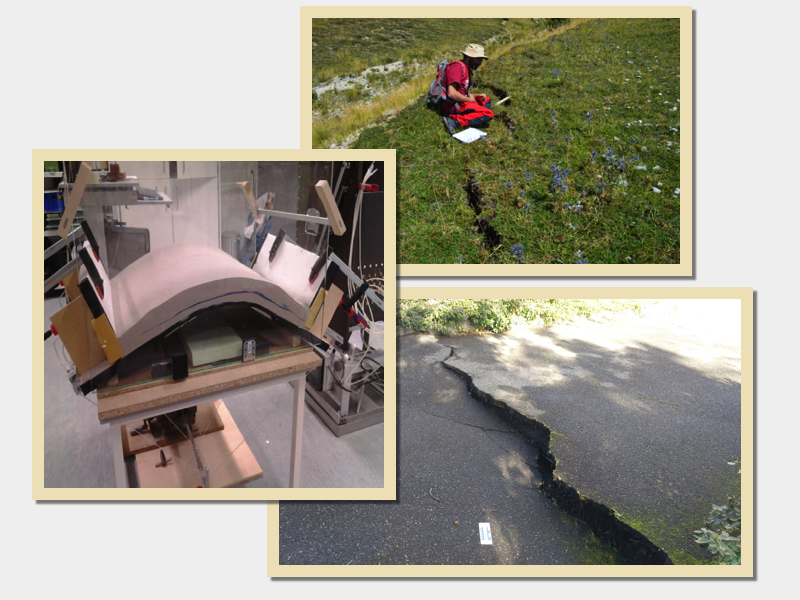 Our experts in Earthquake Geology took part in field investigations after the main Italian earthquakes occurred in Amatrice (central Italy) in 2016, Ischia island (Gulf of Naples, south Italy) in 2017, Mt. Etna (Sicily, southern Italy) in 2018. On the left: Analogue experiments on bending-moment faults at the RWTH Aachen University labs. On the right-top: Mapping ground breaks on the Mt. Vettore (Aug 24, 2016 Amatrice earthquake, Central Italy). On the right-bottom: Evidence of the Dec 26, 2019 Valgrande earthquake, at the foothills of Mt. Etna (southern Italy).